Rightways: Penang Paya Terubong Residents living under shadow of fear! Put on hold: A view of the site for the development of four apartment buildings in Paya Terubong, Air Itam. GEORGE TOWN: Since the deadly landslide in Tanjung Bungah, people in Paya Terubong are looking over their shoulder – and up at a nearby hill. They have been trying for years to stop a project comprising four towers, each over 40 storeys tall, approved on a hillside across the road from their homes. Because the project has already been approved, the residents are down to one last resort – the state Planning Appeals Board. “We must try. The only thing between our homes and those four towers will be a new two-way street that the developer will build if this project goes on,” said Taman Sri Rambai and Taman Lau Geok Swee Residents’ Association chairman Dr Ti Lian Geh. The plan, he said, was supposed to be six-storey townhouses but the developer put in a request to change it to high-density apartments. He said the residents have been living in fear after learning that the development plan was changed to three blocks of 47-storey luxury apartments and a 41-storey block of affordable housing. He said a hearing is ongoing with the Planning Appeals Board to stop the development. “Building skyscrapers on a steep hillslope is dangerous. If the towers come down, the whole neighbourhood will be gone,” he said, adding that the high-density project will also worsen traffic congestion there. He told a press conference yesterday that the earthworks two years ago caused frequent flash floods, mudslides and torrential mudflows in the neighbourhood. Penang MCA and Gerakan, which organised the press conference, urged the state government to revoke the approval. Bukit Gelugor MCA division deputy secretary Choong Jun Jie said that every time there is a downpour, the residents worry. “We do not want another tragedy,” he said. Penang Gerakan vice-chairman Oh Tong Keong said people’s lives are in jeopardy when highrise projects are given priority. 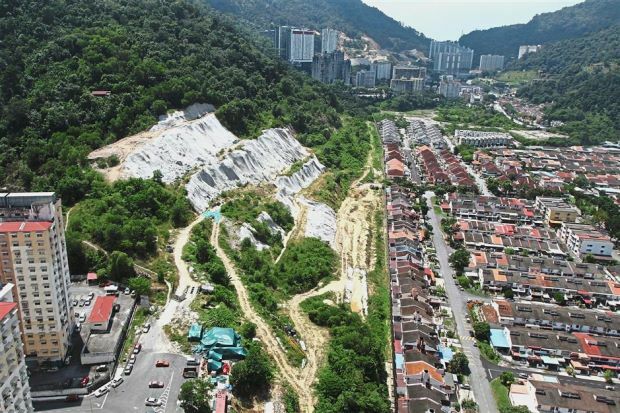 The staggered hillslope is now covered with geotextile sheets after the Penang Island City Council issued a stop-work order about two years ago. Penang Island City Council Engineering Department director Addnan Mohd Razali said all construction work there except for mitigation measures have been stopped pending the outcome of the residents’ appeal. https://youtu.be/QB45Q2_mOG0 Suspicious activity: A photo taken from Penang social activist Anil Netto's blog showing an active s.